Steve and I started off on a small coastal property near Taree in NSW. 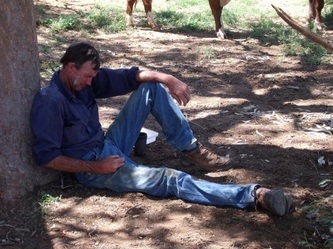 Steve had spent most of his first working years on the big runs in the Territory. After hearing endless stories about the Top End it wasn't long before I convinced Steve into taking me there. Our property was put on the market and so began an adventure I will never forget. We worked all through the Kimberlys and the N.T. Handling big mobs was a wonderful experience. It soon came time for us to settle again and we purchased a small block called "Elvavale" at Torrens Creek. Our stock camp shrunk to just us and our remaining children at home (Rebecca and Caitlin). It was here we started to use working dogs again. We also started contract mustering and although the years to come were hard, it gave me so much insight into the different ways people chose to handle stock. No matter how long you are in this industry I don't think you should ever close your mind to learning from others. 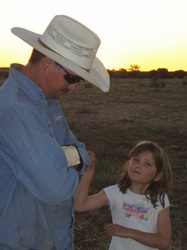 "Elvavale" grew too small and after a horse accident ended my mustering days we headed to Longreach. "Spring Plains" is 42000 acres of mixed country. We grass fatten dry cattle. The climate is hot and dry but when the rains come it is the sweetest country. There are some very rugged areas that capture the beauty of the place. 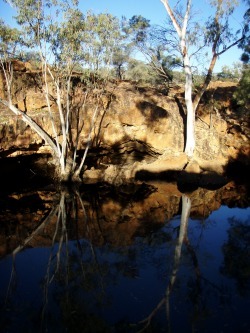 Natural rockholes that are perfect for swimming, camping or just to pull up and boil the billy. It was here I started to improve our dogs. Turning over cattle regularly can mean we have to deal with difficult mobs. The dogs took on an important role in the control and education of the stock. 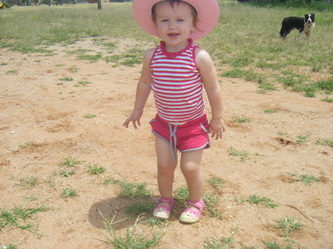 Rebecca finished her schooling and left home which meant our stock camp was down to Caitlin. Caitlin joined me in the breeding, training and looking after of the dogs. She is very active in the business and owns her own dog, Moriarty Glee. Caitlin has a love of animals and a strong opinion on the treatment of them. She is young and full of fresh ideas, which I welcome. Both Caitlin and I have started this venture with strong guidelines in place. We have done the research and put in the time to breed and train better dogs that have natural ability to work stock. We start the training on sheep and finish on cattle. We use both horses and bikes but prefer horses when starting a dog. Caitlin and I have started to sheep dog trial. We do train the dogs around a course but it is not the main focus as the dogs must perform in the paddock before we will consider breeding from them or selling them. Over the years we have used both Australian and Imported genetics to better improve our dogs. We are happy with our lines, our current stock and the puppies we produce. Kaden Collies love to race through creeks, swim in rockholes, sleep under trees but most of all they love to work and they work well.